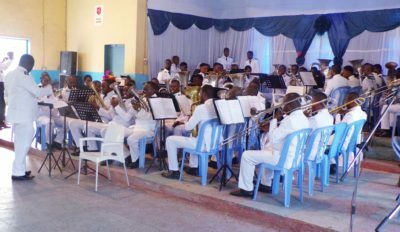 Kintambo Band (Bandmaster Sergeant Henri Makanda Nkodia) shared the stage with the Matete Band (Bandmaster Sergeant Achille Ngombi) in the Kintambo hall on 19 August 2018, offering a praise and worship concert for the glory of God. Both groups were in fine form. From these copper sounds a superior force escaped, able to shake the objects, to deliver the captives, to give peace of heart, to console the afflicted, and at the same time reveal what is buried deep within the heart. It was an exciting evening to show listeners that music can be an element to one day release the secret aspirations of the human soul. The scene was opened with They Shall Come from the East (Kevin Larsson), conducted by Bandmaster Ngombi. The concert closed with The Last Amen from the Kintambo Band, with the audience singing along at the end of the piece. This article was posted in News and tagged Achille Ngombi, concert, Henri Makanda Nkodia, Kintambo Band, Matete Band, worship on 8 October 2018 .